This coin salutes all those who have achieved the rank of First Lieutenant in the U.S. Air Force. 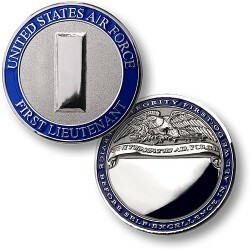 The obverse contains a rendering of the insignia worn by all Air Force First Lieutenants. The reverse has an open area suitable for engraving a name or personal message. Minted in a nickel alloy, this coin is imbued with colorful enamel highlights on both sides. Each coin comes packaged with a detailed header card that describes the mission and history of the U.S. Air Force. This coin can be engraved for an additional charge.